White nationalist Richard Spencer's free speech fight against Google, Facebook and other tech companies has some unlikely support from the left. Following the violence in Charlottesville, Va., Silicon Valley tech firms removed far-right groups from search results, cut off their websites and choked their ability to raise money online. The moves have leaders on the far-right calling for the government to step in and regulate these companies. They have some strange bedfellows in this — many liberals also are calling for more regulation of the same companies. On the far-right is Richard Spencer. He is a white supremacist. "I would ultimately support a homeland for white people," Spencer says. "I think that ethnically or racially defined political orders are legitimate." After Donald Trump was elected president, Spencer got some press about a speech during which he shouted: "Hail Trump! Hail our people! Hail Victory!" and members of the audience gave him a Nazi salute. But, it is the First Amendment that now inspires Spencer, who was a speaker at the white supremacist rally in Charlottesville. In the wake of the violence that occurred there, the Daily Stormer — an online neo-Nazi publication — was blocked by a series of major tech companies. Its domain name was taken away by GoDaddy. Google stopped linking to it. Facebook took down links to any article it published. And it can't use PayPal anymore. "Getting kicked off Facebook or YouTube or PayPal or whatever, this is effectively losing the ability to speak," Spencer says. "It is actually a more powerful form of censorship" than it would be if a government were to censor. Companies like Google and Facebook are not covered by the First Amendment, which applies only to the federal government. But Spencer feels these companies are so large that the government needs to step in — just as it did with broadcasting. Spencer says that otherwise, there won't be freedom of speech. "These are the free speech platforms in the 21st century," he says. "So if we're going to regulate all of these 20th century ways of expressing ourselves, then why are we so loath to regulate the 21st century ones, which are much more relevant and much more vital?" Spencer has some unlikely allies on this. Robert McChesney, a communications professor at the University of Illinois, describes himself as a Democratic socialist and has written books about the threat of fascism. "I think Richard Spencer and I wouldn't agree on hardly anything," he says. "But on the issues of whether these companies should be able to control what I can and can't hear, I think in principle we have to be together on that. All Americans should, across the political spectrum." Right now, Google has more than 80 percent of the online search market, according to Net Market Share. Google and Facebook combined have 77 percent of the online ad market, and 79 percent of Americans on the Internet have a Facebook account, according to Pew Research. "The research shows that if Facebook or Google changes the algorithm just slightly and puts a different type of story in there, it affects the way people think about the world," McChesney says. "Their internal research demonstrates this." Because these are private companies, they don't have to reveal their algorithms or what changes they make to them. Currently, many Americans may agree with the choice to censor the Richard Spencers of the world, but McChesney says it might not always affect groups people don't like. "What's to stop them from turning around and saying, 'Well, we don't like these people who are advocating gay rights. We don't like these people who are advocating workers' rights'?" he says. That is the question leading both white nationalist Spencer and left-leaning professor McChesney to call for the government to step in. Silicon Valley tech firms are pushing back on hate groups, deleting them from search results, refusing to host their websites and choking off their ability to raise money online. NPR's Laura Sydell reports that some on the far right now want the government to better protect their First Amendment freedoms online. 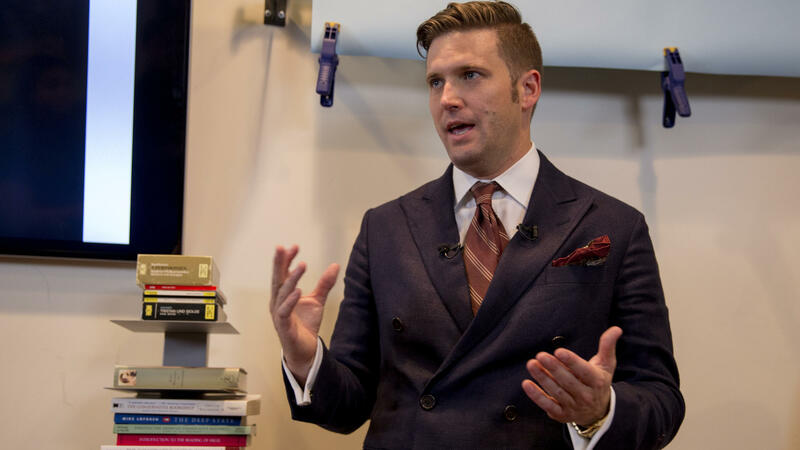 LAURA SYDELL, BYLINE: Most people in the U.S. would find Richard Spencer's political views reprehensible. He's a white supremacist. RICHARD SPENCER: I would ultimately support a homeland for white people. I think that ethnically or racially defined political borders are legitimate. Absolutely. SYDELL: After Donald Trump was elected president, this moment of Spencer giving a speech at a white supremacist meeting made headlines as the room rose to give a Sieg Heil, the Nazi salute. SPENCER: Hail Trump. Hail our people. Hail victory. SYDELL: But it is the First Amendment that inspires Spencer now. Spencer was also a speaker at the white supremacist rally in Charlottesville. In the wake of the violence that occurred there, The Daily Stormer, an online neo-Nazi publication, was blocked by a series of major tech companies. Its domain name was taken away by GoDaddy. Google stopped linking to it. Facebook took down links to any article it published. It can't use PayPal anymore. SPENCER: Getting kicked off Facebook or YouTube or PayPal, whatever, this is effectively losing the ability to speak. It is actually a more powerful form of censorship than were a government to censor it. SYDELL: But companies like Google and Facebook are not covered by the First Amendment. The First Amendment only applies to the government. But Spencer feels these companies are so large, the government needs to step in just as it did with broadcasting. SPENCER: These are the free speech platforms in the 21st century. So if we're going to regulate all of these 20th century ways of expressing ourselves, then why are we so loath to regulate the 21st century ones, which are much more relevant and much more vital? SYDELL: Spencer has some unlikely allies on this. ROBERT MCCHESNEY: I put myself as on the left. I would say I'm a Democratic socialist. SYDELL: Robert McChesney is a communications professor at the University of Illinois. He's actually written books about the threat of fascism. MCCHESNEY: So I think Richard Spencer and I wouldn't agree on hardly anything. But on the issues of whether these companies should be able to control what I can and can't hear, I think on principle, we have to be together on that. All Americans should across the political spectrum. SYDELL: Right now Google has more than 80 percent of the online search market, according to Net Market Share. Google and Facebook combined have 77 percent of the online ad market. Seventy-nine percent of Americans on the internet have a Facebook account, according to Pew Research. McChesney says that these companies can make a little change to an algorithm and it will affect what everyone sees. MCCHESNEY: The research shows that if Facebook or Google changes the algorithm just slightly and puts a different type of story in there, it affects the way people think about the world. Their internal research demonstrates this. MCCHESNEY: I mean, what's to stop them from turning around and saying, well, we don't like these people who are advocating gay rights, we don't like these people who are advocating workers' rights? SYDELL: Nothing. And that's why both alt-right leader Richard Spencer and left-leaning professor Robert McChesney think it's time for the government to step in. Laura Sydell, NPR News. Transcript provided by NPR, Copyright NPR.